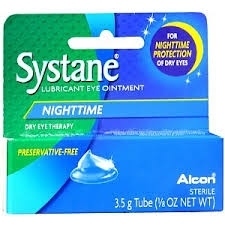 Long lasting Systane lubricant eye nighttime ointment. Eye drops work great during the day, but dry eye symptoms can also bother you while you sleep. Luckily, for nighttime dry eye protection, there’s long-lasting SYSTANE® NIGHTTIME Ointment. Designed to keep your eyes lubricated and comfortable during the night, SYSTANE® NIGHTTIME forms a smooth, comfortable protective layer for the eyes. Available in 3.5g preservative-free tubes of eye lubricant, SYSTANE® NIGHTTIME helps provide relief during the night. Please read this carton carefully and keep for future reference. Pull down the lower lid of the affected eye and apply a small amount (one-fourth inch) of ointment to the inside of the eyelid. Store at 46-80 degrees F (8-27 degrees C). Active Ingredients: Mineral Oil (3%), White Petrolatum (94%). Inactive Ingredient: Anhydrous Liquid Lanolin (3%).